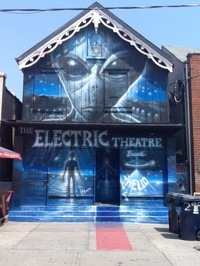 Alien dance invasion brings the rave to the stage at Toronto’s Electric Theatre. What’s an alien enthusiast to do when the alien invasion actually happens? High-energy, electronic musical Hello, written and directed by Mandy Leon, posits this question using dance, musical theatre, and projection. Upbeat, dance influenced electronic music, and laser lights created an upbeat, rave-esque atmosphere for this show. I am an avid techno-dancing enthusiast and had I been hearing this music in a club I would have been a bit bored. As a musical theatre soundtrack, Kait Ast’s compositional approach was ideal. On the whole, I highly enjoyed the performance. The story was engaging and made effective use of humour. Victoria Fuller as the idealistic news anchor was particularly hilarious as she made reports on increasingly urgent alien incursions on civilization as we know it. Her reports were juxtaposed with news reports from China, with translations and popular culture news clips projected on a backdrop. Props were minimal but very effective and several locations were created convincingly. In the opening scene, chorus members holding long stalks were used to create the locale of a farmer’s field. Adrian Yearwood as X, and Marcus Starks as the man in black, a shadow representing his thoughts, did very well with several song and dance numbers. Mr. Yearwood interpreted the role of X, a socially dissatisfied “believer”, with sensitivity and depth while maintaining the energetic, light tone of the piece. I also very much enjoyed Erin Brookhouse’s choreography. It was dynamic, and based on formalization of popular dance moves. There were several very skilled dancers in the chorus and all of the principal characters did well with their steps. Reliance on vernacular musical and dance motifs seemed to be a priority for this concept. This approach appeared to resonate with the audience who seemed very engaged by the form and the content. I would recommend this performance to anyone looking for light summer fare, with fun tracks and dancing. Yeah! Great show! What a lot of fun! Great show!. I have seen many on and off broadway shows, and this one is a must see. As as a DJ i really appreciated the well timed true to electronic music soundtrack. Great job on the music. The acting is very well done. They have all obviously been doing this for some time. Great story and amazing lighting and effects!. They have all done a great job! A must see!!! Great show to bring someone too, music was catchy and upbeat. Believable story line you hope you never have to live through!